The competition has been held annually for the past 29 years to reward and advance excellence in the architectural profession countrywide. It involves regional competitions at eight major South African universities in the build-up to a national award ceremony in Johannesburg in 2017 at which the overall winner is named and presented with a prize of R50 000. Liza Corgne, Key Accounts Manager – Architects presented prizes to architectural students of Tshwane University of Technology at the University in Pretoria. The regional winner of R8 500 was Kim Geldenhuys, with Micah Strydom receiving the R6 500 second prize and Jason Alexander and Lidderd Grobler sharing the third prize of R4 500. The prize of R4 500 for the best use of clay masonry was won by Riaan Steenkamp. Kim Geldenhuys’ Community food production facility investigates the potential of architecture to be a device/instrument of knowledge and skills transfer. The user is placed at the centre of the design exploration and becomes the main design generator and informant of the architectural investigation. With its vibrant street life, strong sense of community and complex informal urban fabric, the Alexandra Township in Johannesburg faces many socio-economic challenges and infrastructural shortcomings. This design investigation addresses increased concerns of food-security and lack of communal, open space in Alexandra due to high population densities and overcrowding. The needs of the user informs the creation of a place for the farming, distribution and consumption of fruits and vegetables. Based on community involvement, the architectural response aims to encourage ownership, adaptability and mutual skills exchange. In second place Micah Strydom designed a High-Performance Rowing Centre at Roodeplaat Dam. Strydom says that advanced training facilities and a development programme will advance the sport for the continent. Lidderd Grobler’s entry, is entitled Equilibrium which is a multi-use indoor and outdoor sports facility at Berea Park in the Pretoria CBD. Co-winner Jason Alexander’s thesis is an automotive design institute and motoring exhibition centre at Zwartkops Raceway in Port Elizabeth. Riaan Steenkamp’s entry, the design of an Autism learning centre in Attridgeville identified a need for a project of this scope in the poorly serviced west of Tshwane. He said, the material use for this project needed to be humble and sensitive to its surrounding context while becoming a landmark within the Atteridgeville streetscape. Thus, clay bricks were chosen because of its versatile, modular nature and ease of use. Steenkamp said his project incorporates hyposensitive-combination and hypersensitive spaces. The materials used needed to be dynamic enough to be used in many ways creating a legible, coherent environment for each of these different sensitivities. Clay bricks has been used extensively in many forms to aid in wayfinding and characterisation. For example, a technique was used called filigree. This is to create patterns within the brickwork. This animates the façade, inspires movement and demonstrates focal points as well as aiding in spatial organisation. The correct choice of building materials was a factor in ensuring environmentally friendly construction practices, Corgne said, and it was hard to ignore the sustainable properties of clay masonry in this regard. Elaborating on the sustainable building properties of clay brick, Corgne said that it contributed many other benefits to a building project such as durability, low maintenance and long-term life performance whilst ensuring a healthy indoor environment. 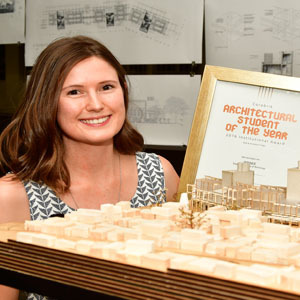 Kim Geldenhuys has won the Tshwane University of Technology regional finals of the Corobrik Architectural Student of the Year Award. She is pictured with her winning entry, a community food production facility in Alexandra. Winner – Kim Geldenhuys on 074 9999 709. Kim lives in Middleburg.